lessah « DDOcast – A DDO Podcast! DDOcast is a weekly DDO podcast created by fans for fans! We discuss nearly everything related to Dungeons and Dragons Online – Eberron Unlimited. Episode 227 is ready! Here’s a LINK to the episode – just left-click to play, right-click and ‘save as’ to download as an mp3. You can find DDOcast on iTunes, the Zune Marketplace and Cyberears.com. 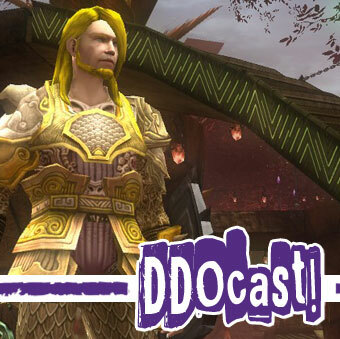 This week Sig and Anne talk do a mini-podcast and give you this weeks DDO news. Skaggy also has another DDO Poetry Corner for you! And we have a bonus interview with Lessah of the DDO Cocktail Hour. 4:42 DDO Poetry Corner with Skaggy! 11:26 Interview with Lessah of DDO Cocktail Hour! Hi Everyone! Episode 178 of the DDOcast is now ready to go! Here’s a LINK to the episode – just left-click to play, right-click and ‘save as’ to download as an mp3. You can also find DDOcast on Cyberears.com, iTunes, the Zune Marketplace and many other podcast aggregators. On a personal note, doing a live show is very intimidating and there are ten thousand things that can go wrong (and did!). Jerry makes it look so easy! Props to him and please get your computer hooked up soon! 00:40:52 Chatroom Trivia and DDO Points giveaway! 00:58:39 Turbine Download Manager gone? 01:01:35 DDO Daily’s UI SKin Article and New Forums! 01:03:26 Clankenbeard chatroom trivia, DDO Points Giveaway! 01:05:23 Blast from the past, Clip from Episode 101, Micro transaction scoop! LINK to Update 6 and Underwater Combat!